Kidney problems in horses probably happen much more often than we realize. Low back pain is a classic symptom of kidney problems in people. In horses low back pain can easily be attributed to other more common problems such as hock soreness or overwork. 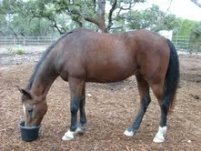 A good holistic horse care program will include appropriate horse feeds for the kidney but some conditions will need additional treatment in the form of herbs or acupressure. In Western Medicine the kidney is primarily an organ that maintains water balance and removes toxins from the blood. Traditional Chinese Medicine (TCM) recognizes these roles but also several more critical functions. In TCM the Kidneys store the essence or Qi that is inherited at birth. This Pre Heaven Qi is used up during life and can only be partially replenished with Post Heaven Qi from food. In TCM the Kidney is responsible for the vitality. In TCM the Kidney Essence is the foundation for the Marrow. Marrow in TCM is the substance that makes up the bones, bone marrow, brain and spinal cord. Strong Kidneys therefore mean strong bones, teeth, and a healthy nervous system. In TCM the Kidneys are the house of the Will Power. When the Kidneys are strong the mind can stay focused on goals but if weak the mind will become easily distracted or depressed. The Kidneys are considered to be the origin of the heat that fuels all the bodily functions. This Fire comes from the Gate of Vitality that resides between the right and left kidneys. The Kidneys are the origin of both the Fire and the Water in the body, the Yang and the Yin. Kidney weakness can occur with weak genetics, inadequate nutrition, old age, chronic blood loss, hot, dry weather or excessive work that depletes body fluids through sweating. Stress, chronic anxiety and worry will also deplete the Kidney Essence. Breeding young healthy horses is the best way to create foals with good Kidney Qi. Good nutrition throughout life will guarantee the Qi is replenished on a regular basis. Alfalfa is one of the best horse feeds for kidney support. Barley is a excellent choice if grain is needed and kelp offered free choice is a good choice for a supplement. The most common kidney patterns I see are congestion which shows up as stocking up in the legs, bloating in the abdomen and soreness in the lower back. If the horse is not already getting horse feeds to support the kidney I will add those and add a mild diuretic herb such as dandelion leaf or uvi ursa. I look at acupressure points GV4 to strengthen the Gate of Vitality, BL 23 to support Kidney Yang, and SP 6 to clear dampness. If there are any signs of fluid buildup in the lungs, such as a moist cough, I will add BL 13 and LU 7. The other kidney pattern which I have been seeing more since we are in a severe drought pattern is Kidney Yin deficiency leading to heat signs such as dark, scanty urine, lower back soreness, dry manure and restlessness. Some horses will even seem and bit feverish in the late afternoon. In addition to the horse feeds for kidney support I start aloe vera juice and marshmallow root to build Kidney Yin and sooth the kidneys. I treat acupressure points KI 3 to tonify the Kidneys, KI 6 to support Kidney Yin, and CV 4 to support Kidney Yin and calm the mind. A horse can’t be healthy without healthy Kidneys. Since the Kidneys supply to Fire(Yang) and Water(Yin) for all the metabolism they must be treated along with any system that is not functioning up to par. A good holistic horse care program including whole foods and natural management will usually support healthy Kidneys, but be alert for symptoms of Kidney imbalance.